I love rainy days. Nothing is cozier than burrowing under the covers with a good book or plopping down on the couch for a daylong movie marathon when it’s wet outside. Of course, that implies I get to stay home when it rains, which is usually not the case. Often, I’m cursed with commuting to work or running errands during a downpour. And when that happens, it’s time to break out the rain gear. 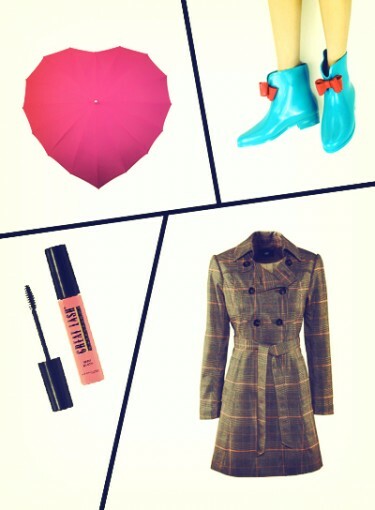 Find out how to dress for a rainy day here. Before you start picturing a bright yellow raincoat and those clunky rain boots you wore as a child, stop. Because rain gear has come a long way since then. These days there are high heel wellies, decorated umbrellas, and designer style parkas. I still get grumpy about heading out into the rain, but at least I know I look somewhat chic doing it. Since everyone has to deal with the rain, whether you live in Seattle or not, you might as well embrace those rainy days. If you need help getting in the mood, I suggest blasting a little Rihanna — “You can stand under my umbrella/ ella, ella, eh, eh.” That always brings a smile to my face. Then, check out this gallery of super stylish rain gear. Who knows? You may like these pieces so much you start looking forward to those rainy days, just like me.